Pea Protein, Pea Starch, Natural Flavors, Hemp Protein, Pumpkin Seed Protein, Alfalfa Protein, Xanthan Gum, Stevia Leaf Extract, Sea Salt, Bromelain. Plant-based protein blend made from pea, hemp, alfalfa and pumpkin. 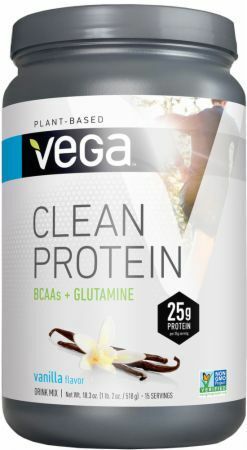 Shake one level scoops of Vega Clean Protein in ice-cold water or non-dairy beverage and enjoy after your workout. Or blend Vega Clean Protein into your favorite smoothie recipe.